The ski and snowboard industry is finally starting to design gear specifically for splitboarding. 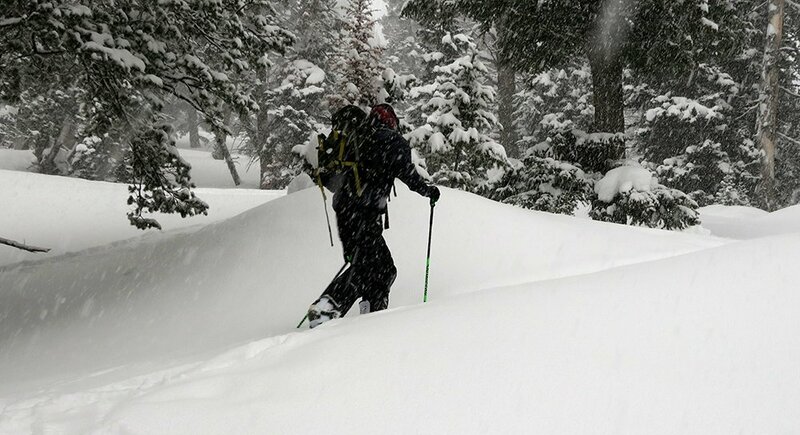 We wanted to find out how these splitboard poles held up in various temperatures, snowpacks and other variabilities including the length of the tour. All the splitboard poles were thoroughly tested on tours here in the Tetons, in BC and Tahoe. A few of the best splitboard poles listed below can actually pack down small enough to toss inside your backpack, while the rest can easily be attached to the outside of your pack for the descent. Your skier friends may try and steal these poles from you as they are actually designed for skiing but again work amazing for a day of splitboarding. 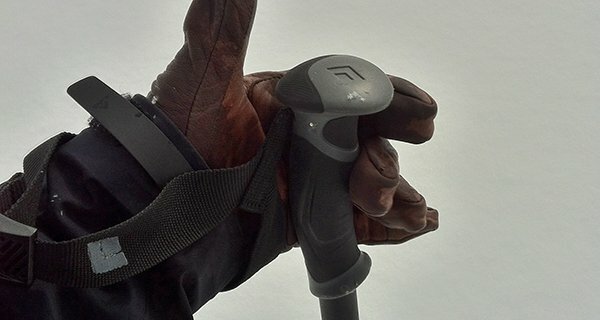 The Black Diamond Expedition 3 Ski Poles are simple in design with very few moving pieces. This is a pole you can trust in the backcountry thanks to Black Diamond’s tried and true FLICKLOCK. 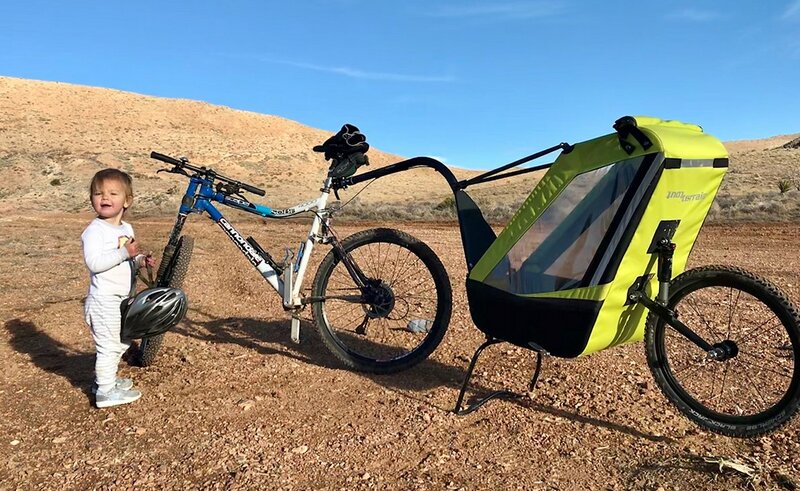 The Expedition 3 as the name implies is a 3 piece pole made of 100% Aluminum that weighs in at .57 lbs (260 grams) per pole. The 62-140cm pole breaks down to 24.2 inches (62 cm). Be careful when putting the baskets on these poles as the plastic threads can easily strip. 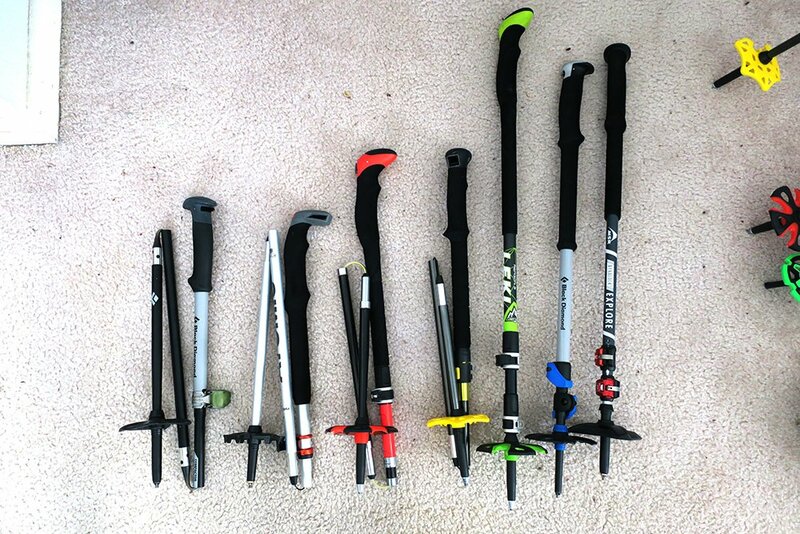 The poles I most often find myself grabbing before heading out the door are the LEKI Tourstick Vario Carbon Poles. I had mentioned them last year in our splitboard pole roundup and they just keep getting better year after year. Out of the box, these poles come with some burly looking straps from LEKI. The Trigger S straps which are easily removable and specifically made to release upon impact which was taken from LEKI’s ski racing background. Personally, I cut or remove all the straps from all my backcountry poles as it’s a safer way to travel through the mountains. Weighing in at .55 lbs (253 grams) the LEKI Tour Stick Vario Carbon Pole is easy to swing around and offers up a ton of places to grip the pole on the way up. With these poles I often find myself holding the grip toward the lowest part on the pole. These poles offer up a ton of power on the up. Thee LEKI Tour Stick Poles break down to 15 inches (39 cm) for the descent. Atomic, yes the ski brand makes a great simple collapsible pole that works wonders for splitboarding. Starting with the baskets, these powder baskets are designed for chomping on snow. The BCT Pole is made of Aluminum Alloy which makes it one of the lightest poles on the market. This pole may look simple, because it is, and that’s exactly why we like it. Atomic’s BTC pole also happens to packs down the smallest of any of the collapsible poles we tested. Atomic’s BCT Mountaineering SQS Pole offers extra grip thanks to foam wrapped around the handle. 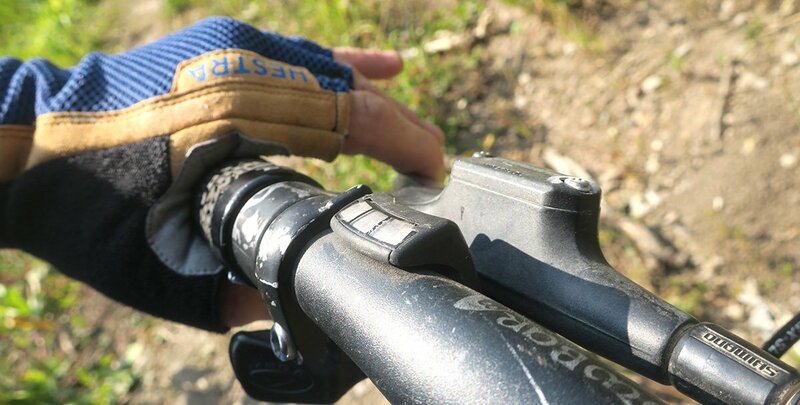 The top of the pole is made of hard plastic which starts to be noticeable against your palm on longer tours. 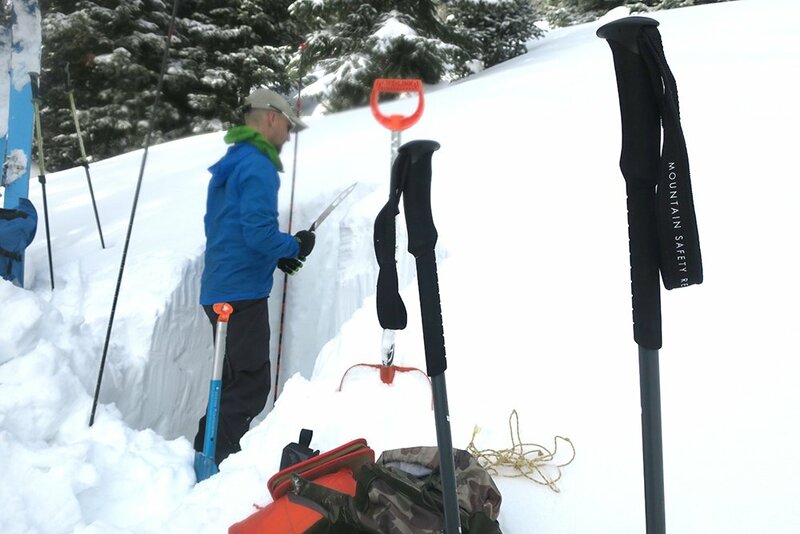 One when of the most trusted names in backcountry safety (BCA) makes a set of backcountry specific splitboard poles you really should take note. One of the best features of these poles is simply how small the pack down (17″ or 45.7cm) in length. This means to you can stuff these poles inside your backpack if you have room for them. Otherwise, they can easily be latched down to the outside of your pack. 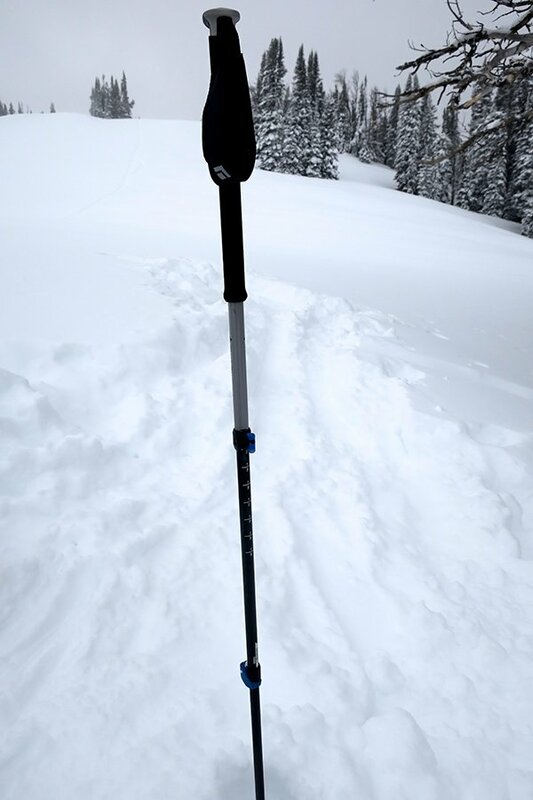 If you’re familiar with tossing an avalanche probe out you will dig the feel of the Backcountry Access Scepter 4S pole. To engage the pole once it’s broken down simply pull the top section of pole out while tossing the rest of the pole away from you, and wah-la the splitboard pole is ready to go. This is one of the simpler designs we have used. Black Diamond took the success of the Z-pole compactibility and updated it into the sleek and lightweight Carbon Compactors. The Carbon Compactor splitboard poles are activated via a tension-lock system, in mere seconds the assembly is complete helping to speed up you’re transitioning. Couple unique things about these poles, first off the grip on the top of the handle works great for lifting your binding risers while touring as it has an extra lip that sticks out. Also, the baskets are semicircle which makes them grip nicely while ascending steep firm hills. And finally, a pleasant benefit of carbon poles is that much less warmth is pulled away from your hands than a metal equivalent. The Dynalock Explore handle grip is made of rubber and there is foam that runs down about a foot from the top of the pole that allows for various positions to hold. The adjustable straps are not removable. Rossignol is now in the splitboard game thanks to the Xavier de la Rue. Although Rossignol’s poles are more focused on skiing they work great for splitboarding too. 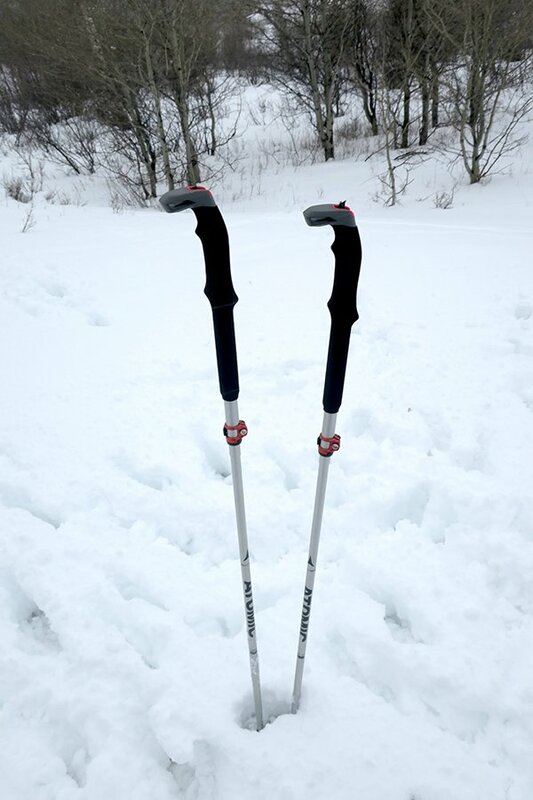 I tested out Rossignol’s Touring Pro Foldable Pole in a fixed length 125cm. This 3 piece pole is made of Aluminum and weights in at just over a .5 lb (255 grams) per pole. The Handle offers nice rubber grips with a harder material at the top and removable straps. The most unique feature on these poles are the baskets which can swivel back and forth on the snow. What this does is offer a solid contact point with the snow regardless of what angle the pole is placed. LEKI Tour Stick Vario Carbon Poles ($199) 2016 Model. 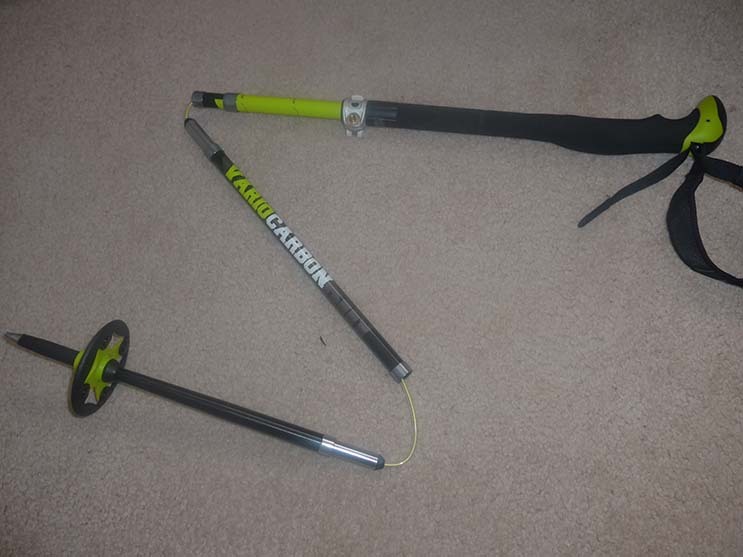 My second favorite pair of splitboard poles is the LEKI Tour Stick Vario Carbon. If the baskets on these poles were a little bit larger and more rigid they would have easily been our top pick. 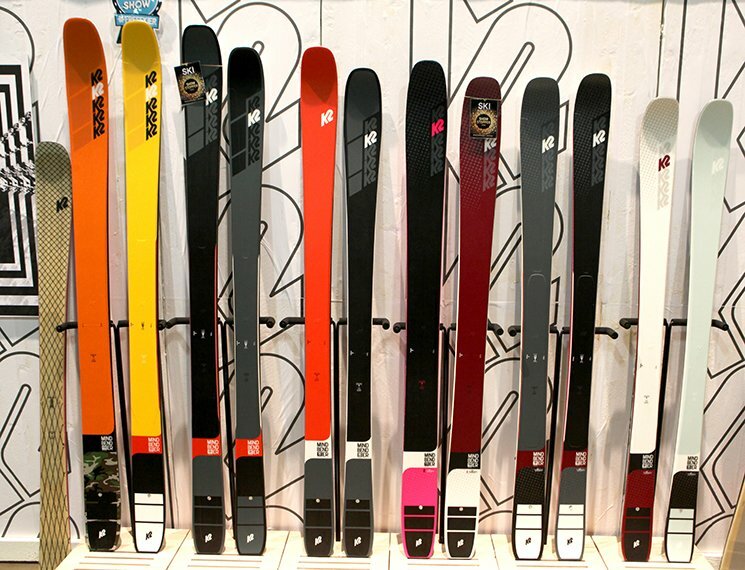 Vonn, Steigler, and Shiffrin all rock LEKI – wait aren’t those all skiers. Yep, and they rip too. 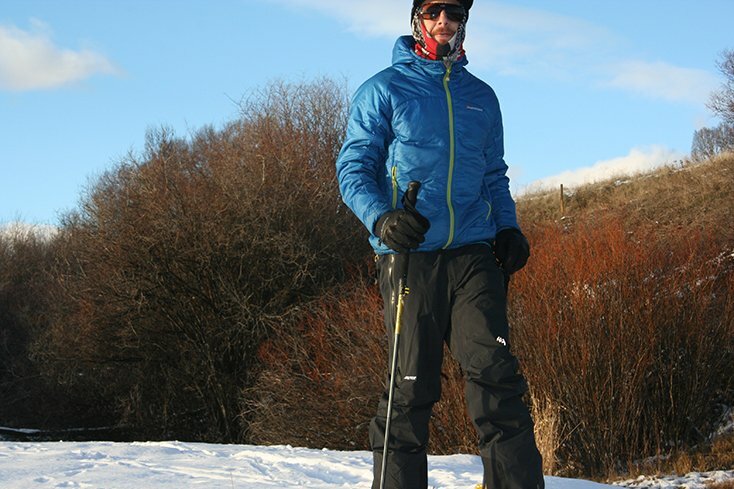 When the worlds best skiers pick LEKI maybe you should too? 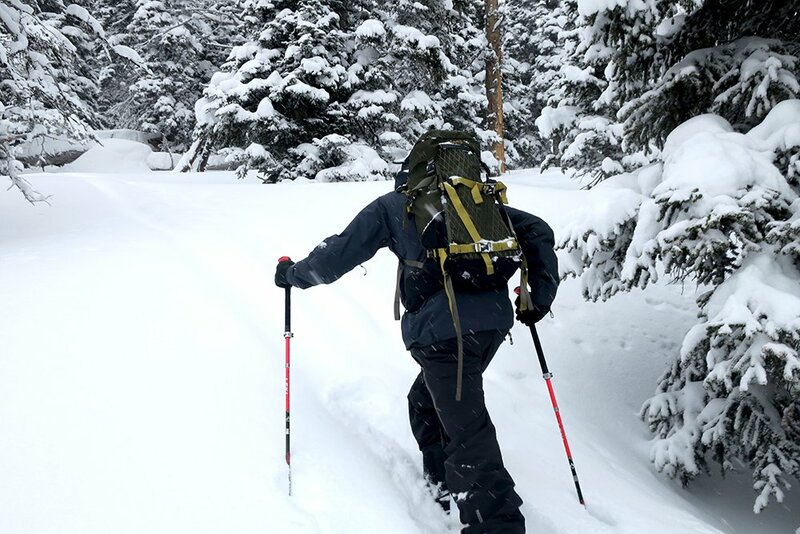 These splitboard poles pack down to (16″ or 40.64cm) which makes them the smallest on this list for when tossing inside your backpack or for rigging as mentioned above. Similar to the Scepter from BCA the LEKI Tour Stick Vario Carbon splitboard poles are put together by tossing the poles away from you while holding the shaft. This action again mimics that of an avalanche probe. It will be hard to find a better high performing pole on the market than the Tour Stick Vario Carbon from LEKI ($199.95). Are there any poles missing from the list? Possibly, however, we are very selective of the gear we test, especially gear we take into the backcountry and then stand behind with our reviews. Now that we have your splitboard poles dialed, what about your splitboard skins? Lorcar, I have yet to try the Komperdell poles, however if you wait till Fall we will have another 10+ poles in the roundup. The MSR are going to be more durable. You can remove the straps of the BD Expedition 3 by pushing / hammering out the silver pin. Got any documents showing how? Hi Mike, – any info on the actual weight of the ATOMIC poles? THANKS! Hi Mike – have you had a chance to try out the Jones Explorer carbons? Thx. Jones Poles were not available in time for last years test, hoping they have some for the next go around. I just wanted to let you know that the link for the Atomic BCT Mountaineering SQS Poles goes to the BCT “Touring” SQS Poles (wrong item) which is not collapsible. The “Mountaineering” Poles (collapsible) are $169.95 not $139. Aside from this mistake, great information. I just ordered the BCT Mountaineering Poles. Thanks for the feedback and catching the link. Got it fixed. PS those are my “favorite” poles on the list. Or atleast the ones I grab when I know it’s going to be a big day. One of things I am most curious about which you didn’t address in any of your reviews about the poles is the sturdiness. I am 6’3″ 240 lbs and in need of a sturdy pole for touring. I had the compactor z poles which are now broken and bent up in many places. Sturdiness is most important to me. Can you help me out with some recommendations? We ran into the same thing with the Carbons a few years back they seem a lot more durable now. That being said they are carbon… The strongest ones on the list so far are the Black Diamond Expedition 3 Atomic, MSR. I sent a few broken poles back if those brands step up there game this year we will consider including them to the list for the following season.